Bishop of Chelmsford repudiates episcopal "talent pool"
It was a glorious sermon, with an audacious, if not subversive (which some may call prophetic) intervention on the Church of England’s emerging “talent pool” approach to recognising bishops. St Paul’s Cathedral hosted the consecration of the Rev’d Anne Hollinghurst as Bishop of Aston, the Ven Ruth Worsley as Bishop of Taunton, and the Rev’d Ric Thorpe as Bishop of Islington. The sermon was delivered by the Bishop of Chelmsford, the Rt Rev’d Stephen Cottrell. This ministry I have been called to is not something I put on in the morning and take off at night, it is a sacramental identity, part of what it means for me to be baptised, to be a follower of Jesus. And one of the first responsibilities of a bishop is to be an angel, a messenger, an evangelist, the one who endlessly and constantly tells the story of what God has done in Christ. And although I don’t much like the soundbite culture we live in, if you pushed me into a corner after the service and demanded one from me, I think I would say that for our culture at this particular time, it is that in Christ you can become yourself. You can be set free from the snares and temptations of a world that tells you you aren’t good enough, good looking enough, thin enough, clever enough, young enough, and find a new identity and become completely yourself as you are meant to be in the communion with God that the death and resurrection of Jesus Christ makes possible. As teacher and evangelist this is the first job of the bishop. Not MD of CofE plc; not safe pair of managerial hands, not just emerged slick and shiny from the talent pool, not even graduate of the latest whizzy business school offer of better organised salvation (though these things can help us), but storyteller, poet, theologian: a gospel person, with the good news of Christ and on our lips and in our hearts, and this good news translated into the languages of the smorgasbord of cultures in which we serve. Which is also why being a bishop is so dangerous. We either draw back from such an uncomfortable proclamation. Or end up holding back the Spirit’s sure advance into all truth. Meanwhile, to o many people still treat us with the wrong sort of deference and respect, and believing our own publicity, we collude. What are we looking at? Where do we go? To whom do we speak? What is our perspective? What demands attention? And what is it we choose to ignore? Are we just going to be a church for those gathered in; or once again a church for all the world? For to be a sentinel – a contemplative watchman for the Lord is, to quote Sr. Isabel Mary SLG ‘hard, combative and boring’; it is not to detach yourself from the world, but to stand on the heights and survey the world in all its joys and horrors, interpreting the world to the church and the church to the world, warning of danger when everyone is feeling safe, and proclaiming the victory of Christ when everything looks and feels defeated. 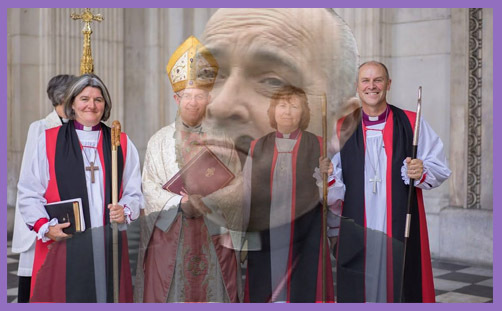 So – a new line for the litany – Good Lord deliver us from successful bishops, from too well prepared or even too well organised bishops, from ready answer in the back pocket and PowerPoint strategy self-sufficient, all efficient bishops. Take us to those high places, places of perspective and reality, where we and all our schemes are set on fire, which, paradoxically for us, are also those places where life is raw, and pain and darkness requisite. Take us to the heights of prayer, to the depths of the scriptures, to the bottom step before the altar, to places of silent waiting where, with mitres off and staffs laid down, we will be replenished and know our need of God, and there be renewed and strengthened for the things that lie ahead as bishops of God’s church – messengers, sentinels and pastors. The report expects to see all senior leaders equipped with a standard toolkit of MBA-type organisational skills. But it does not say how this might connect with the primary calling of bishops as “shepherds of Christ’s flock and guardians of the faith of the apostles”. Or what the implications for public ministry might be if bishops now move from being chief pastors to chief executives. Despite the report’s stated aspiration to increase diversity in senior leadership (much needed), there seems to be no space for the bishop as scholar, evangelist, contemplative, theologian, prophet, or pastor. Or scope for senior church leaders who might be visionaries, risk-takers, and pioneers. Bishops cannot be “slick and shiny” safe pairs of hands from “the latest whizzy business school”. Such is the way of the world: it is how political parties now determine vocation; a touch of diversity sprinkled with celebrity and ephemeral photogenicity which all combine to trump decades of party loyalty and philosophical integrity. Those who are ‘approved’ to stand for Parliament are those whose beliefs are agreeable to the elite and whose ‘talents’ are universally admired. But bishops cannot be so discerned: far from being “slick and shiny” and “safe pairs of hands”, bishops must be prepared to get dirty, and, if necessary, to hold their hands in the fire; to proclaim unpalatable truths when they might offend; to preach the gospel of salvation in season and out. Oh, don’t expect some appointed developmental committee of technocratic elites to approve of your visionary candor, which they will mistake for insolence. And don’t bother waiting for your MBEs or OBEs or knighthoods to affirm your tortuous ministerial contemplations or your prescient tales of looming apocalypse: these things are commended to the false prophets of inoffensive flattery and politically-correct flummery. Politicians no longer do poetry or theology. God forbid that bishops ever cease doing prophecy.